Regardless of how you're styling your hair, chances are sleek edges are on the menu. Nothing sets off a natural hair style better than tamed, natural looking edges (unless you're going for the messy look...which can be cute). There are plenty of products out there that can slick down your edges, but they tend to leave hair hard, crunchy, dry, and prone to breakage. And let's face it: traction alopecia, thinning and breaking edges are not cute...no matter how much hair you have. But all is not lost! If you're looking for a product that can give you a touchable hold while nourishing your edges, check out the seven products below. Bonus: most of them double as styling products, too (making it all the more digestible to shell out a little more dough)! I mentioned this little jar in my article about alternatives to EcoStyler Gel. Truthfully, it's quite a gem and definitely has a taffy-esque feel. I purchased it at CVS during their buy one, get one half-off sale which made the paying $12 a little more palatable. After using it for months, this product easily became one of my favorites for sleeking buns, laying down edges when I rock my hair straight, and even for braid-outs and sealing in moisture. 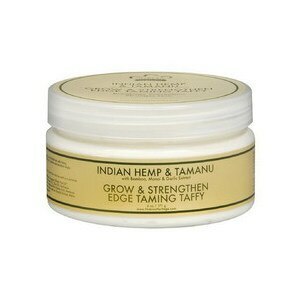 Based in lots of organic goodies, the Edge Taming Taffy will provide a touchable hold. For an even sleeker look, spritz hair with water before applying. I nabbed this gem on sale at my local Sally's on sale, and haven't turned back. I tend to love everything Eden BodyWorks does, and the Temple Balm is no exception. I love this product not only to give me a light and moisturized hold (with a light tingle), I also use it as a part of my nighttime routine before I pineapple my hair. It's a great way to ensure that my edges are getting a little extra TLC to withstand the gentle pulls of buns, headbands, ponytails, and more. This Herbal Styling Balm is one of my small business faves. It does a wonderful job of sleeking edges without harming them. Because this particular product is more stiff than the others on this list, a little bit goes a long way. For extra slickness, spritz hair with water before applying the Herbal Styling Balm. As an added bonus, I like to use the Herbal Styling Balm as an eyebrow wax... don't judge me. It helps tame my brows and keep my arch in check! The one thing everyone I encounter says about this product rings true: it smells GOOD. Similar in consistency to Eden BodyWorks Edge Control Gel, the Control Paste is jelly-like in nature, and provides a slick and shiny hold. It is also great for twist-outs, braid-outs, and other styles, and keeps fly-away hair in check. I like to use it on my edges for buns and ponytails. Because it is water-based, I wouldn't recommend using this product if you are wearing a blowout or flat-ironed style because it is water-based. Another small business gem that soared to the top of my favorite products list. I initially applied this to my hair to style my wash n' go (look for this same product on that list of favorites soon), but quickly realized this product had my edges LAID. Although it has a custard-esque and gel-like texture (reminds me in texture and color of As I Am Smoothing Gel), it doesn't feel nearly as heavy and leaves hair incredibly soft. Seriously, I can't get enough of this product. It does everything it says it will do, and more. As a matter of fact, let me go order some more right now...before ya'll buy it all up. Remember when I said I tend to love everything Eden BodyWorks does? This product is no exception. This jelly-jam product moisturizes, imparts shine, and smoothness all in one. As soon as it rolled onto shelves, I scooped it up. Of all the products listed, this one is the most simple. I listed the first 6 ingredients, and well, that's all there is to this product. A little bit goes a long way, so even though the jar is only 6oz, it will last a pretty long time. Of all the products on this list, the Smoothing Gel is probably the heaviest hitter. It is the one product that truly, truly feels like a gel. It is rather thick and heavy. But the one thing it doesn't do is leave crunch. If you feel the other products on this list may be a little to lightweight, give this gel a go. It provides a super slickness, shine, and softness; it lays hair FLAT. Also, if you're interested in trying this product out for a more controlled wash n go, it is definitely a viable option. Just don't be too heavy-handed with product. Have you tried any of these products? What are some of your favorite products to keep your edges in check?